Styled just like classic tin toys, this new windup toy is perfect to entertain kids! Cosmo Robot is a sturdy toy standing 10 inches tall. His movement is triggered by a metal windup key attached to his body. The wheels in his base roll him forward. 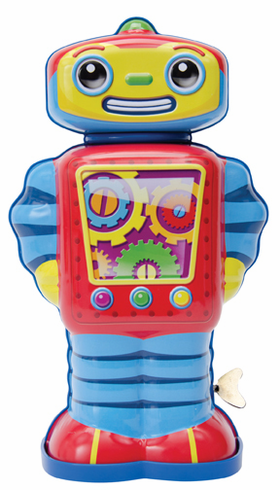 Cosmo Tin Robot Retro style windup tin robot toy utilizes fine motor skills. Ages 3 +.